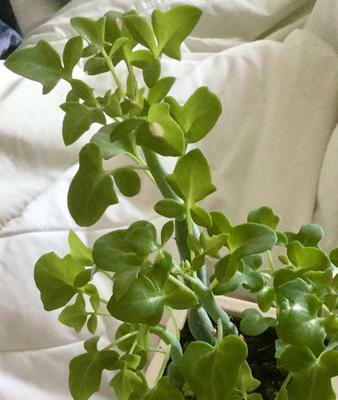 Can you identify this plant please? We bought this at a plant sale in the UK. The seller didn’t know what it was. It’s now about 12 inches high. Thank you. Comments for Can you identify this plant please? Senecio articulatus – also known as Candle Plant, Hot Dog Cactus among other common names. If it's got really roundish stems stacked atop one another, it could be the form globosa. At certain times of year, the leaves will fall off, and then you can see the stems, like in this picture. Let me know if this is not the same one - if the stems are smooth it could be something else. Check the links on this page for similar plants. See the page on Senecio for more on how to keep them happy.